Lightweight, long and comfortable GORE-TEX coat for rainy city days. Technical outdoor functionality, comfort and durability brought to everyday designs. 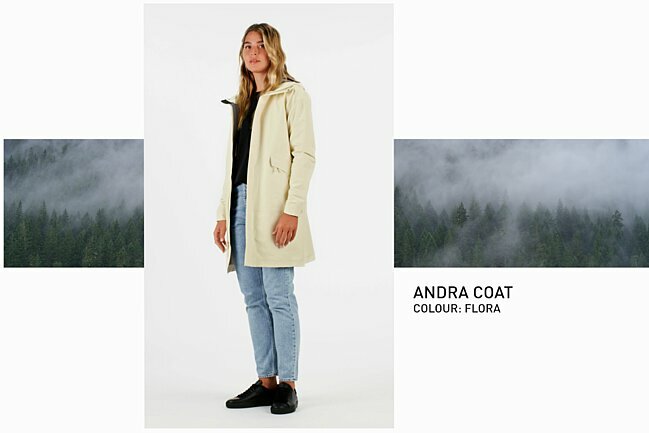 Light enough for summer showers, protective enough for driving winter rain, the Andra Coat provides waterproof, breathable protection from city storms. The 3L GORE-TEX fabric with GORE C-KNIT™ backer technology is soft, quiet and lightweight. The length provides extended coverage, and the hood adjusts for a custom fit. The clean, minimalist design and relaxed A-line silhouette give the Andra a look that fits any urban environment. Longer length and insulation give maximum weather protection. A higher insulation weight means more warmth. Shells provide wind and wet weather protection with minimal warmth but allow for layers during colder temperatures.